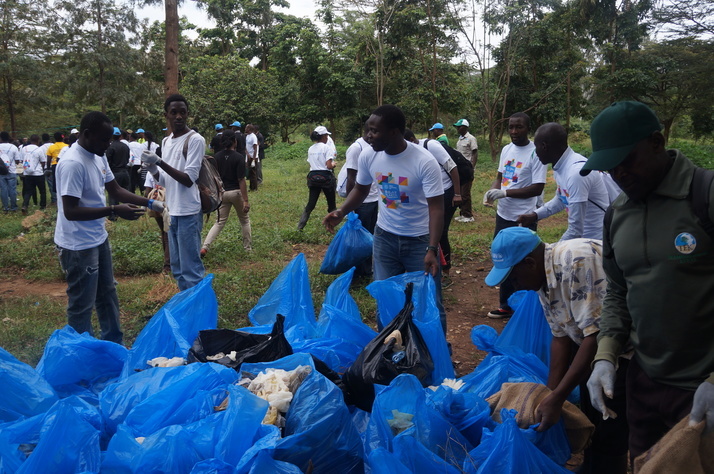 To mark World Environment Day, on June 5th, about 200 volunteers, mainly youth, came together to clean up City Park. The efforts focused around the central lawns and fishpond and in the green space opposite the market. The clean-up was coordinated with the efforts of Kenya Environmental Education Network, UNEP, Nairobi County Staff, Friends of Karura, Friends of City Park, university students and Third Party Alliance. In her closing remarks, Ms. Venna, Environment Officer for Westlands reminded everyone how preserving nature is preserving our very existence. It was agreed with the county staff and Mr. Patrick Orengo, Ward Administrator, that we require spades and proper equipment to tackle these larger rubbish piles – which were infested with red ants. The young enthusiasts who tried to tackle these piles were bitten by the red ants and the efforts were stopped. The event was also attended by the sub-county Administrator – Westlands, Mrs Linet Boyani, Kenya Environment and Waste Association Director, Mr. Jared Akama as well as two East Africa Legislative Assembly MPs; Hon. Pamela Maasay (Tanzania) and Hon. Christopher Nduwayo (Burundi) among a host of other guests. Mr. Charles Bartlett of UNEP also commented on the need of a proper waste management strategy so that rubbish collected is separated at site, and disposed correctly. Thank you to all who attended for their efforts and enthusiasm.